Everest Base Camp sends off fairly unwelcoming signals, like being jarred from sleep by the roar of thunderous avalanches or in causing you to wrestle for air from the altitude. 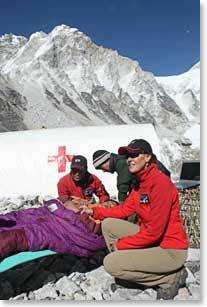 But for Dr. Luanne Freer, founder of the world’s highest medical facility, these are some of the easy challenges to this unique setting. Dr. Freer’s experiences have opened her eyes to what we take for granted here in the western world. In 1999 and through a coincidence, Freer found herself in the Khumbu Valley – home to the world’s tallest peaks – and within three years she was back, this time with a mission that would forever change the Everest landscape. “We have now served over 1,600 people within our clinic,” explains the emergency physician and director of the clinic managed through the Himalayan Rescue Association (HRA). This fall will find Dr. Freer and Dr. Eric Johnson, another veteran of Everest medicine, returning to Everest Base Camp as faculty members on a Berg Adventures operated continuing education trekking experience. The dates are October 1 – 21, 2009. Edmonton based Track & Trail Adventures; one of North America’s top academic retreat producers, is pleased to be working with Dr. Freer and Berg Adventures International on the upcoming “travelling conference”. 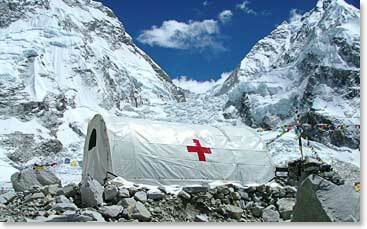 You are invited to join them en route to Everest Base Camp, Nepal for an unprecedented adventure. 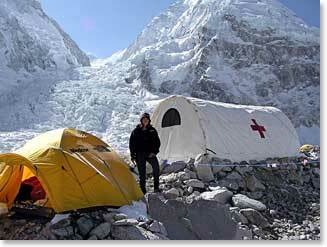 This entry was posted on Thursday, July 9th, 2009 at 11:48 am	and is filed under Everest, Expedition News.